There used to be a time when budget plasmas and LCDs were available, but to reach an affordable price point a lot of corners had to be cut. Times have moved on and now you're more likely to find budget LCDs with many more bells and whistles, including HD Readiness, but that's not the novelty on this, the cheapest 37in LCD currently available in the UK. Mirai - a new entrant to the UK flat TV market - has gone for U-shaped speakers to give the T3715C its Cobra nickname. But despite its innovative design and HD Ready resolution, it doesn't take long to see how Mirai has reached this remarkably low price. First, there's only an analogue TV tuner - so Freeview pictures are off the menu. Secondly, the ins and outs are basic. There's just the one HDMI input, accompanied by component video, three Scarts - two of them RGB - a VGA PC input, composite video, S-video, phonos and an RF aerial input. Still, beneath the front flap betwixt the speakers lay connections for S-video, composite, phonos and a headphone jack. Third in the Mirai's roster of disappointment, the picture performance on the Cobra is poor. It may be designed to show-off the benefits of high-definition TV, but it does it on a very budget scale. Yes, the extra detail is visible on the high-resolution 1,366 x 768 panel. A blast of 720p footage through the component video inputs reveals colours that look bright and well saturated, and the level of detail in close-ups is impressive - but here's the catch. Still HD images look great, but movement is a major problem. Even basic camera pans leave a ghosted image lagging behind the on-screen action and our only conclusion can be that the Cobra is using an LCD panel with a slow response time. This kind of problem will never completely disappear on LCD as a screen technology, but it's always there on the T3715C. There's also some noticeable problems with contrast, because dark areas of the image are stained with picture noise, and a lack of depth and detail in comparison to bright footage. The more we watch this TV, the more we're sure that its LCD panel is dated. Of course, HDTV takes no prisoners and can easily reveal the weaknesses of any screen, so a spin of some DVDs might be more forgivable. It doesn't work out that way. Noisy and strewn with jagged edges, the Cobra still struggles with the same problems of motion blurring and a lack of contrast, although detail is fair and vivid colouring is its saving grace. 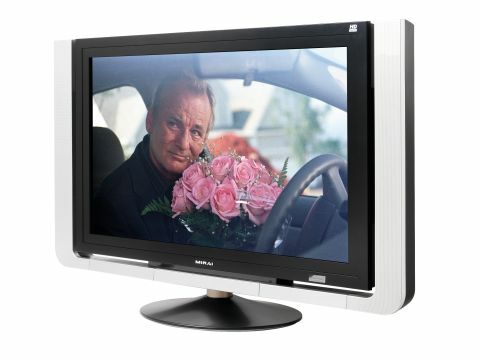 For the best pictures this Cobra can offer, use a HDMI DVD player and upscale DVD footage to 720p. The audio system is similarly flawed and lacks fine detail and bass, although its preset 'surround sound' mode while average, does at least widen the soundstage a little.